Trinity United Methodist, Hackettstown, NJ . Primary comparative texts about Prayer and Piety (includes texts about healing) from Philo, Josephus, Lucian, Pseudepigrapha, Babylonian Talmud, Midrash, Philostratus. At Mahlon H. Smith's (Rutgers University) Into His Own: Perspective on the World of Jesus. "Simon's Mother-in-Law," "Healings and Exorcisms," "To Other Places," The Jesus Database, an online annotated inventory of the traditions concerning the life and teachings of Jesus. Dr. Gregory C. Jenks, FaithFutures Foundation. VI, 47, 53; VII, 1-4, 8; Tatian's Diatessaron (c. 150-160). Commentary on a Harmony of the Evangelists, John Calvin, 1558: Matthew 8:14-18/Mark 1:29-39/Luke 4:38-44. "By healing different diseases he shows that he has brought true life into the world." "Wherever Christ comes, he comes to do good. He cures, that we may minister to him, and to others who are his, and for his sake." "He was about to begin His first preaching and healing circuit; and as on similar solemn occasions (Lu 5:16; 6:12; 9:18, 28, 29; Mr 6:46), He spent some time in special prayer, doubtless with a view to it." Commentary, Mark 1:29-39, Matt Skinner, Preaching This Week, WorkingPreacher.org, 2015. "This passage is loaded with wonderful possibilities for the preacher." "Freedom For," David Lose, ...in the meantime...2015. "... Jesus frees us not only from things that seek to oppress us, but also for a life of purpose, meaning, and good works." Commentary and illustration idea, Mark 1:29-39, Scott Hoezee, Center for Excellence in Preaching, 2015. "On Being Restored to Yourself," Karoline Lewis, Dear Working Preacher, 2015. "The healing of Simon's mother-in-law (and I so wish she had a name) is God being, living who God is. God called Jesus to be who he was. That's what the incarnation is all about." "The Holy One In Unholy Places," D Mark Davis, Left Behind and Loving It, 2015. "It is this preaching's nature not to stay settled and rooted in a single place among a fixed audience but to seek new settings and opportunities to express itself." "That All Be Made Well," Jan Richardson, The Painted Prayerbook, 2015. Use of images. "Lifted to Service," Linda Fabian Pepe, Theological Stew, 2015. "Jesus heals this woman- she is brought to wholeness- to completeness- and she takes her rightful role in service to others." "We Are As Good As Dead," Sonja Olson, Question the Text, 2015. "The demons know the identity of Jesus. They know the power he has. Do the healed have the same knowledge?" "Jesus - the Healing Revivalist?" Bob Cornwall, Ponderings on a Faith Journey, 2015. "Speaking to the Soul: Learning and Loving," David Sellery, Episcopal Cafe, 2015. "Valued or Ill?" Andrew Prior, One Man's Web, 2015. "Well, ultimately Jesus' healing and casting out demons brings him head on into conflict with the Empire. Empire is demonic." "The Politics of Healing," John Allen, Political Theology Today, 2015. "He came to heal the world, not only of its illness, but of its unhealthy subjugation to empires. He came to exorcize the demonic lies that uphold oppressive systems. And this is a challenge to those of us who 'proclaim the message' today." "Raised Up to Serve!" Thomas Beam, 2015. "A Mother-in-law Story," Nancy Rockwell, The Bite in the Apple, 2015. "What if the civic prayers to which we cling at the opening of Town Meetings, Parish Councils, Politicians' Breakfasts, sessions of the Senate, invoked the Holy Spirit to deliver us from pigheadedness, rigid thinking, our own anger?" "Simon's Mother--in-Law: An Exquisite Awareness," Janet H. Hunt, 2015. "Have you ever experienced the sort of miraculous healing experienced by Simon's Mother-in-Law and the others in today's Gospel? What were you more deeply aware of afterwards? What 'exquisite awareness' was then yours?" "And There He Prayed," Andrew King, A Poetic Kind of Place, 2015. "In Search of a Deserted Place," Lynn Miller, Art & Faith Matters, celebrating our creative and living God by generating art and architecture resources for congregations and individuals. Art and Faith Matters facebook page contains additional resources. "Up from the Sickbed and Right to the Stove!" Scott Barton, poetry, 2015. Commentario del San Marcos 1:29-39, Heydi Tatiana Galarza Mendoza, Working Preacher, 2015. Commentary, Mark 1:29-39, Sarah Henrich, Preaching This Week, WorkingPreacher.org, 2012. "Silencing those demons and beginning to serve," Peter Woods, I Am Listening, 2012. "Do you also hear the present continuous sense to it? I love the implication that it was the beginning of perhaps, a lifetime of service?" "God's Reign in 3D," John van de Laar, Sacredise, 2012. "My Little Tiny Secret," Neil Chappell, a weird thing, 2012. "A Dark and Deserted Place," Rick Morley, 2012. "Managing What Matters," Janet H. Hunt, Dancing with the Word, 2012. Holy Textures, Understanding the Bible in its own time and in ours, Mark 1:29-39, David Ewart, 2012. "Jesus' followers have an immediate and worthy need that should be attended to. It is something they have already done - with great success - and could do again - also likely with great success. Very tempting. But it is not, 'What I came out to do.'" Jesus' Teachings and Miracles, audio telling, story in episodes, graphic, audio and written commentaries. Go Tell Communications, Biblical Storytelling for the Global Village, 2012. "The Secrets We Keep," Alyce McKenzie, Faith Forward, 2012. "The healings and exorcisms reveal the effects of Jesus identity and divine power, but the good news is not reducible to them." Comentario del Evangelio por Ruth-Aimée Belonni-Rosario, Working Preacher, 2012. Commentary, Mark 1:29-39, James Boyce, Preaching This Week, WorkingPreacher.org, 2009. "Jesus Heals Peter's Mother-in-Law," Michael A. Turton's Historical Commentary on the Gospel of Mark, "a complete verse-by-verse commentary on the Gospel of Mark, focusing on the historicity of people, places, events, and sayings in the world of the Gospel of Mark." "Healings," "Hunger for Healing," Gospel Analysis, Sermons from Seattle, Pastor Edward F. Markquart, Grace Lutheran Church, Seattle, Washington. Detailed background and exegesis. "First Thoughts on Year B Gospel Passages in the Lectionary," Epiphany 5, William Loader, Murdoch University, Uniting Church in Australia. "You could surmise that Mark is making a point here by having the kingdom start at home. That may not be in Mark?s intention, but its truth stands nevertheless." "Anthropologists carefully distinguish between *disease* -- a biomedical malfunction afflicting an organism -- and *illness* -- a disvalued state of being in which social networks have been disrupted and meaning lost. Illness is not so much a biomedical matter as it is a social one. It is attributed to social, not physical, causes. Thus sin and sickness go together. Illness is a matter of deviance from cultural norms and values." "Jesus as Healer," study guide, Robert B. Kruschwitz, (other resources at) "Health," Christian Reflection, The Center for Christian Ethics at Baylor University, 2007. Jesus the Healer, A Markan Epiphany: Lessons from Mark 1, Donald H. Juel and Patrick R. Keifert, Texts in Context, Word & World, Luther Northwestern Theological School, 1988. "The kinds of 'demons' people face today are every bit as destructive as the kind 1st C people believed in & fell victim to. How can we preach & minister, & our congregation operate in such healing ways as will encourage those 'bound' today to face their demons, name them, & accept the Good News that Jesus can 'cast them out' like the ones of old." Wellspring of the Gospel, Ordinary 5B, Catherine McElhinney and Kathryn Turner, Weekly Wellsprings. "Jesus Brings Release," Rev. Bryan Findlayson, Lectionary Bible Studies and Sermons, Pumpkin Cottage Ministry Resources. Includes detailed textual notes. "Preaching the Good News," Larry Broding's Word-Sunday.Com: A Catholic Resource for This Sunday's Gospel. Adult Study, Children's Story, Family Activity, Support Materials. "What are the most important duties of daily life? What crises can upset those duties?" "Mark 1: Jesus in Capernaum and the Tour of Galilee," "Capernaum," "Ministry of Jesus," wikipedia. "...we should attend to the institution in which the healing takes place, either kinship or politics. What roles does the family have in an illness? How are they socially and economically affected? What role do they play in the seeking of a cure? What costs do they pay or debts to they incur? What if the healing occurs in the political realm, even if this is a healing shrine such as the temple of Asclepius at Epidaurus? Healings, moreover, might have important political implications, for "prophets" arose, echoing themes of liberation and freedom. The political significance of the account of the healing by the Jewish Eleazar before the emperor Vespasian and his retinue should not be discounted (Josephus. Ant. 8.45-48)"
Capharnaum, featuring information and images from 19 seasons of excavations. Funk, Robert W., "Form of the New Testament Healing Miracle Story," Semeia, 1978. Hultgren, Arland J., "Healing," issue focus of Word & World, Fall 1982. Kolenkow, Anitra B., "Healing Controversy as a Tie between Miracle and Passion Material for a Proto-Gospel," Journal of Biblical Literature, 1976. Sawyer, Nanette, "Living by the Word," The Christian Century, 2015. Wretlind, Dennis O., "Jesus' Philosophy of Ministry: A Study of A Figure of Speech in Mark 1:38," Journal of the Evangelical Theological Society, 1977. "When Life Comes at You," Rev. Dr. James Lamkin, Day1, 2015. "God Is Present and Active," the Rev. Dr. Judith M. McDaniel, Day 1, 2012. "Join Hands, Reach Out, and Lift Up," the Most Rev. Katharine Jefferts Schori, Day 1, 2009. "Peter's Mother-In-Law, Thomas Dorsey and Us," R. William Carroll, Episcopal Cafe, 2009. "Called to Pray," 5 February 2006, Samuel D. Zumwalt, Göttinger Predigten im Internet: Every Sunday Sermons based on the RCL by a team of Lutheran theologians/ pastors. "Hypochondriasis," Sermons from Seattle, Pastor Edward F. Markquart, Grace Lutheran Church, Seattle, Washington. "Try Finding a Deserted Place," the Rev. Barbara Berry-Bailey, Day 1, 2000. "How Do You Say, 'I Love you'?" Charles Kirkpatrick, Sermons4kids.com. 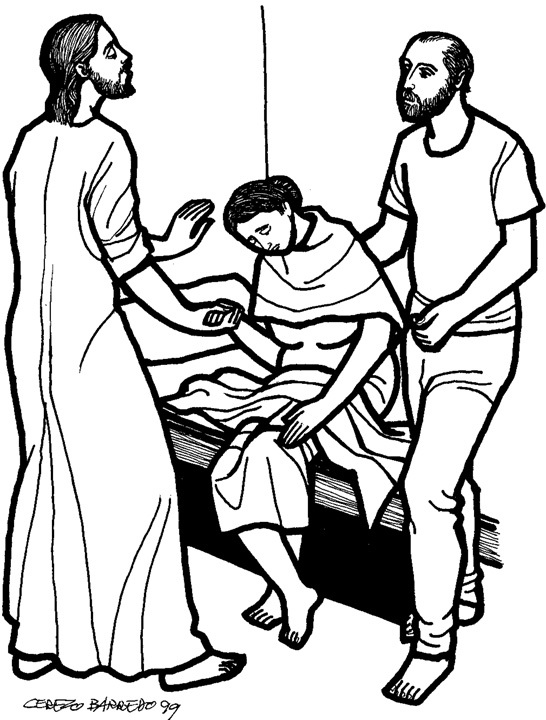 "Jesus Heals Peter's Mother-in-Law," Sunday School Lessons: Family Bible Study, art projects, music, stories, etc. "Take out the Trash," Jim Kerlin, childrensermons.com. "Quiet Time," Nina Wallestad, Dramatic License. Conditions of Use. "Peter's Mother-in-Law," from A Certain Jesus by Jose Ignacio and Maria Lopez Vigil. Ideal for catechetical and liturgical dramatization of today's gospel. Claretian Publications. Clip Art Images: Mark 1:29-39, Misioneros Del Sagrado Corazón en el Perú. Mark 1:29-39, at Cerezo Barredo's weekly gospel illustration. Liberation emphasis. Commercial Site: "A Solitary Place," video for Epiphany 5B / Mark 1:29-39, The Work of the People. Mark 1:38, Heartlight - Free Christian PowerPoint Backgrounds. Hymns with Scripture Allusions: Mark 1:32. The Cyber Hymnal.